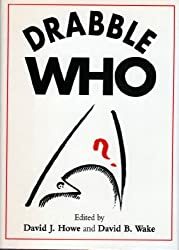 Published to coincide with the 30th anniversary of the BBC TV series Doctor Who in 1993, this book contained 100 “drabbles” – stories of exactly 100 words. The book raised money for the Royal National Institute for the Blind’s Talking Book Fund. Only 1000 copies were printed, because 1000 is a multiple of 100; really, they should have printed 100 x 100 = 10,000 copies. As will become clear from the long list of authors, there were some amazingly famous people involved with this project. I was astonished that I was allowed to be a part of it. My story was published under the name Michael R. Morgan, because, well, that’s my full name. It’s on page 91. Since the book is sold out and all rights to the stories reverted to the writers on publication, I don’t think there’s an issue with me reproducing the story in its entirety. “Isn’t she up yet?” grumbled the Doctor. Ace was like all teenagers; she enjoyed her lie-ins. He turned away from the console, intent on rudely awakening her. The air parted before him as a Giggling Sneersman Assassin slid through a warp:gate and unsheathed poison-tipped scimitars. It lunged, blades poised. The double-doors swung open, abruptly sucking it past the Doctor into the vortex outside. Ace rubbed the sleep from her eyes. “Did I miss anything?” He told her, but she never did believe him. My participation in this project came about through an open-call announcement in Doctor Who Magazine. Basically, fans could submit stories to the book as part of a competition. My story was one of the runners-up and I was in. This book was my first professionally published work, and I was sharing page space with Jon Pertwee. I’m not sure it can get much better than that. I never got my contributor’s copy, by the way. I moved around the time they were sent out and I suppose my copy must have gone to my old address. My landlord did not forward it on. Many years later, I was at a convention with some friends and I saw a copy of the book at a dealer’s stall. I was curious to see how the book had turned out – I did remember sending off my story – and I glanced at the list of names on the back cover… and was astonished to see my name there! I had to pay the vast sum of eight pounds to get that copy. Years later, another friend suggested we wait outside a theatre’s stage door for Colin Baker after a performance of the Pirates of Penzance to get his autograph. I thought asking him to sign Drabble Who might be fun, since he has a story in it. He was very impressed to see a copy after so long and asked why I’d brought it. “Well,” I admitted, “I have a story in it too and I thought I could get a fellow writer’s signature.” He quickly found my entry and stood there in the chilly Stoke-on-Trent night air reading the entire story aloud. When he realised it was about the Seventh Doctor, and not the Sixth, he pretended to be highly affronted. Good ol’ 6-ey.